In my quest for more wireless throughput, my hAP ac with three-stream 802.11ac wireless seemed to be the right choice. The problem was that I had absolutely no three-stream capable equipment to use with it – so I wasn’t seeing any of the benefits of that third stream. In my case, maybe I should’ve gone with the hAP ac² instead and saved the money? The unit comes in a colour print retail cardboard box. The front has an image of the adapter with its four antennas attached, making for an “imposing” half-octopus. I’ve got to wonder how well this works, especially given how closely those antennas are spaced. The rear of the box gives the model as EP-AC1621, listing the specifications. Interestingly, it lists itself as “Draft 2.0”, which makes it sound like a pre-standard adapter. 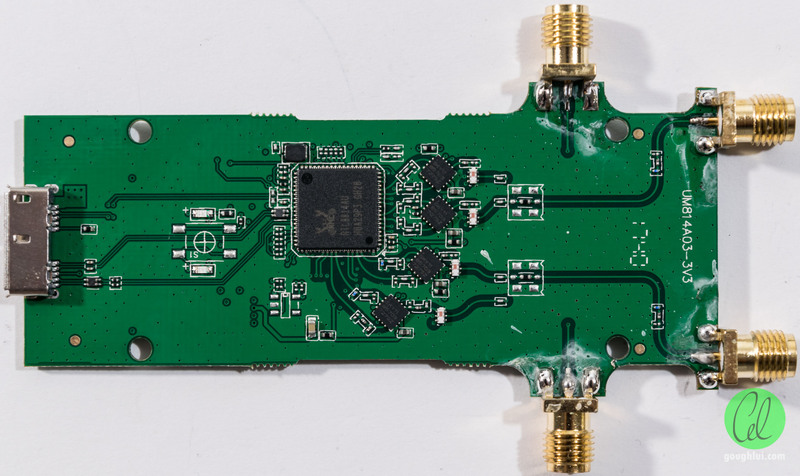 It claims support for up to 80Mhz bandwidth, although the claimed 1300Mbit/s throughput is at odds with its claims of 4T4R MIMO. In fact, it is technically a 4×4:3 – only three chains can be active at any time despite having four antennas. This isn’t necessarily a bad thing – it should be better than a 3×3:3 as it has an “extra” antenna to capture some more signal. 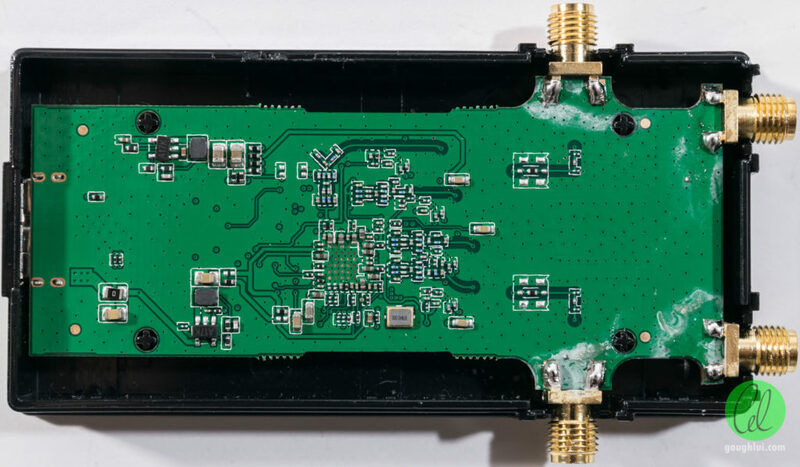 The transmit power is 15dBm in 2.4Ghz and 12dBm in 5.8Ghz making it a little low. I wonder if this is a per-stream or total power output. There is also some strange English with the use of the word “Synchronization”. 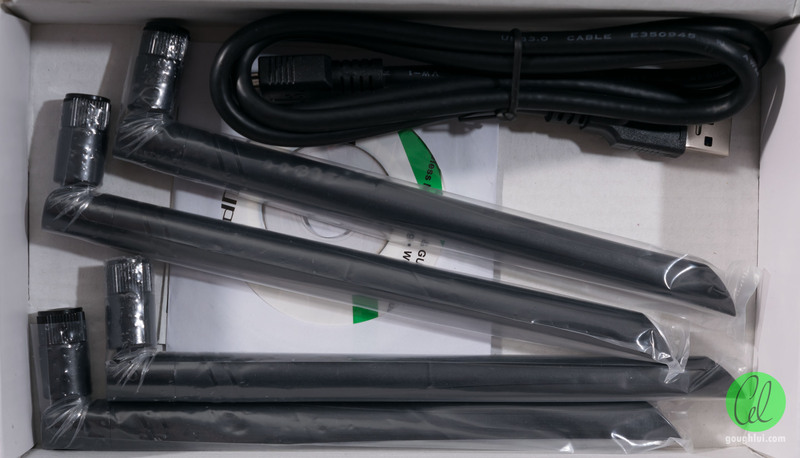 When you open the box, you are greeted by the adapter inside a plastic tray. Below the tray is the remainder of the accessories, including four antennas, the USB cable and driver CD. The USB cable is especially thick and stiff, which makes it pull the adapter about. There is also a Quick Installation Guide hiding below the CD. The adapter itself feels light and hollow. 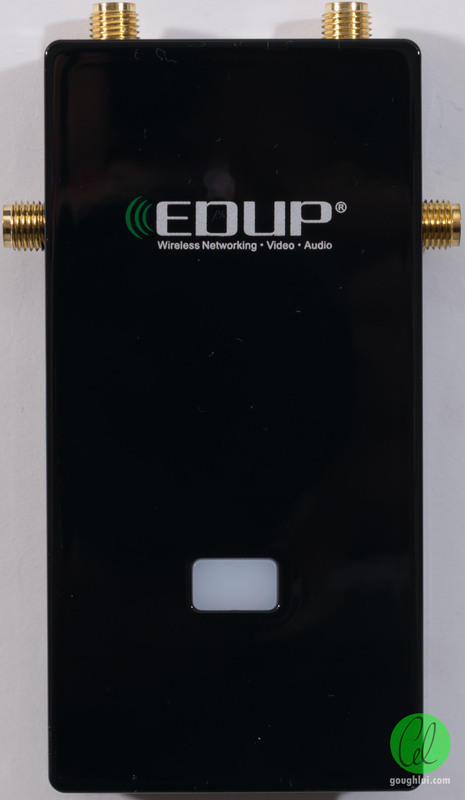 It features a glossy plastic exterior with a simple design incorporating an LED window on the top and RP-SMA connectors along the sides for the antennas. 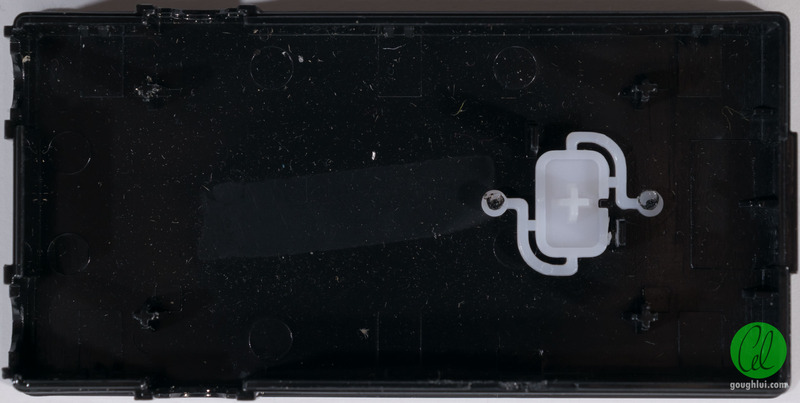 There is a microUSB3.0-B connector for power and data at the bottom, but the unit is otherwise featureless – no feet so it happily slides around. Assembly is easy – unwrap the antennas and screw them in for your “half-octopus”. The orientation of the antennas may need some tweaking though, to maximise stream-to-stream orthogonality. Interestingly, these antennas are the same units provided with my “generic” AC1200 adapter. Downloading the latest version from here, it was a simple task to run the installer and connect the unit and it was up and running. The VID is 0BDA and the PID is 8813. Due to the RTL8814AU chipset in use, it’s slightly less sucky for use with Linux. Drivers can be found online from a number of places, however, it seems I’ve had success with zebulon2’s version. There is also a version from aircrack-ng that supports monitor and packet injection, however, I did find some instability especially on a surprise unplug. Throughput testing was conducted using a server connected on the Gigabit Ethernet segment of the network, serving a 4GiB random-fill file over a network share. 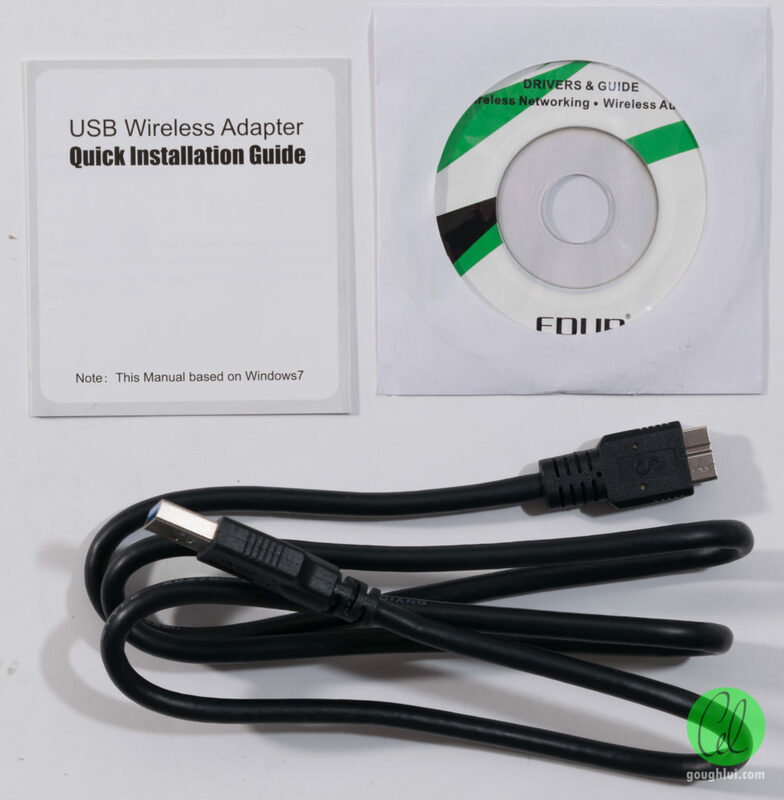 The adapters were connected to a Lenovo E431 laptop running Windows 10 through its USB 3.0 ports, while maintaining AC power connection to the charger to avoid Wi-Fi energy saving performance impacts. The network share was mapped to a drive and Cygwin was used with dd to read the file using 16MiB block size to /dev/null. The reported file throughput was used to compute actual data throughput, taking the average of three transfers. At the server, a regular process running in Cygwin “touch”-ed the random file at one second increments, invalidating any file caches on the test laptop. While iperf is generally regarded as most reliable, I found that in all cases iperf3 reported similar readings but often around 2-5Mbit/s less possibly due to its less aggressive transfer behaviour. the Edup EP-AC1621 USB 3.0 (3×3) 802.11ac adapter (subject of this review). Testing was based on a Mikrotik hAP ac which was serving a “live” network with other users and hAP ac² at close range only, serving a dedicated “best case” 802.11ac-only network. The test protocol worked, with direct GbE connection providing a reading of 954Mbit/s – close enough to the 940Mbit/s expected and is probably down to the timing errors in the dd method and rounding error of the throughput. Throughput in the ideal case with the hAP ac² (supporting two spatial streams) showed all three 802.11ac adapters performed similarly, which is not expected. The single-stream USB 2.0 based TP-Link T2UHP managed to provide 268Mbit/s download, whereas the “generic” AC1200 two-stream managed 276Mbit/s and the three-stream EDUP managed 278Mbit/s. Ideally, we would expect throughput to scale (nearly) linearly with the number of spatial streams, assuming that stream-to-stream orthogonality could be maintained, thus I expected the two and three stream adapters to be able to do double of the single-stream. 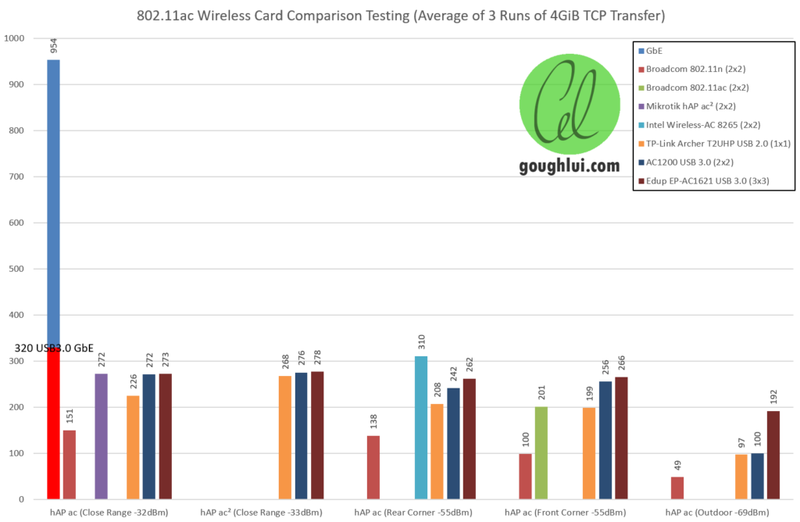 Spot-checks seemed to show that the Broadcom two-stream 802.11ac adapter performed similarly to the single-stream TP-Link TP-T2UHP, whereas the Intel Wireless-AC 8265 was able to exceed all others even at a distance in the house. I suspected USB overhead and poor drivers or chipsets may add a limitation to the achieved speed, so I tested two USB Gigabit Ethernet adapters on the Lenovo E431 using the USB 3.0 port, which was only able to achieve 320Mbit/s under the same benchmark. While this is faster than the 802.11ac, it is a long way from 1Gbit/s. I verified that the hAP ac² was able to operate in two spatial streams and hAP ac was able to operate in three spatial streams to the respective adapters. Physical layer rates reported were 433.3Mbit/s for a single stream, in excess of 650Mbit/s for two streams and 975Mbit/s for three streams. I expected to see something close to ~500Mbit/s in triple-stream mode and closer to ~350Mbit/s in dual-stream mode. This suggested some possibility of limitations in throughput in the Mikrotik equipment or in the compatibility between chipsets. To check this, I ensured the routers did not saturate their CPUs (they didn’t – utilisation < 50%) and tried from Mikrotik hAP ac to Mikrotik hAP ac² in bridge mode and was not able to increase the throughput over the USB adapters even at close range. It is clear that 802.11ac trounces 802.11n throughput, as expected. In some cases, throughput was close to double whereas in extreme cases, the throughput even was close to triple. The single stream T2UHP is at a disadvantage compared to the others, recording slightly less throughput. This is likely due to its single-stream nature and USB 2.0 connectivity. However, despite this, it is always capable of providing better results than a dual-stream 802.11n solution (!!). The unbranded generic AC1200 adapter does provide solid results, until the signal gets weak outdoors where its performance degrades to that of the single stream. This was as hypothesized in the review due to the second “vestigial” antenna. For the price, the performance is quite solid. Peak recorded 802.11ac throughput for the EDUP was 273Mbit/s at close range with the hAP ac, equivalent to the two stream adapter despite being connected with three streams. However, while there was no real throughput advantage with my combination of equipment at close range, at long ranges, the advantages were clear, offering about twice the throughput in the garden as the single-stream and “one-and-a-half” stream solutions. Outdoors, it was able to offer almost four times the throughput of the dual-stream 802.11n solution. 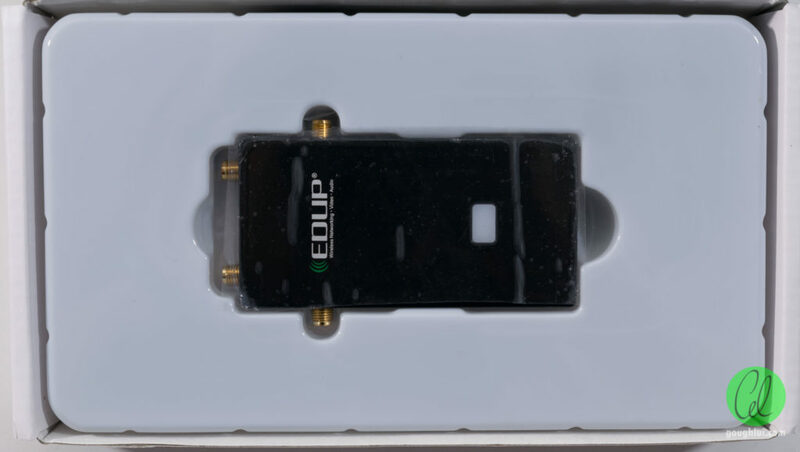 Part of the reason for the rate differences may be due to differences in antenna gains and transmit powers – while the T2UHP was able to achieve maximum MCS for the single stream at close range, the other adapters never achieved the maximum MCS at any distance. This may mean that their signals were not separated enough, the transmit signal was unclean or weak. The Realtek-based cards do not boast high transmit powers – so this may indeed be part of the reason. There may have been differences in compatibility as well between beamforming techniques. Despite this, there is another advantage of higher spatial streams – even if single-client throughput is not improved, the airtime occupied by transmissions should reduce as a function of increased physical layer rates, leaving more airtime for other clients to use. The net “system” throughput should still increase. 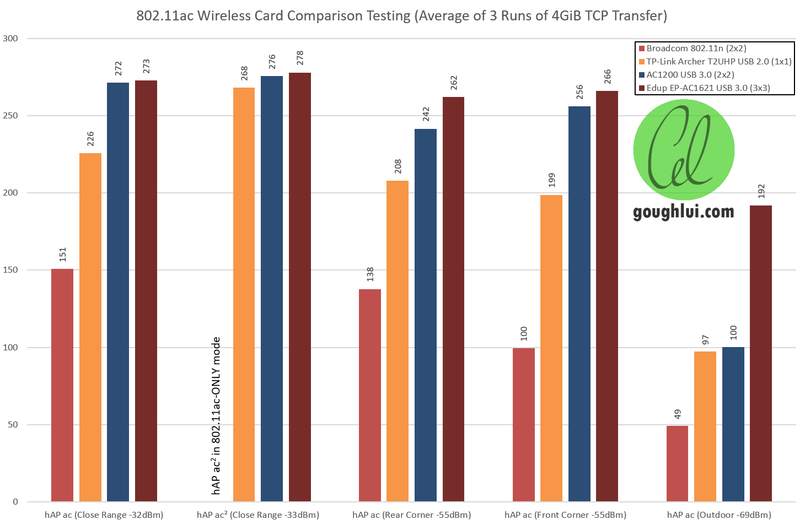 Further research of the expected throughput from 802.11ac solutions provides varying reports of speed – this test with an Asus RT-AC68U (four-stream) showed close-range throughput of 230-310Mbit/s (with the exception of one adapter that provided 404Mbit/s). This test by Anandtech found throughput averages which ranged from 158-464Mbit/s at close range. Another test by TBG for an intermediate distance found data throughputs ranging from about 227-342Mbit/s. In that perspective, while the results were not at the top end of the range, it wasn’t at the bottom either. While some people have been able to achieve even higher throughputs in practice, the likelihood of this happening with “random” low-cost consumer gear seems unlikely and it may boil down to running multiple transfers concurrently. 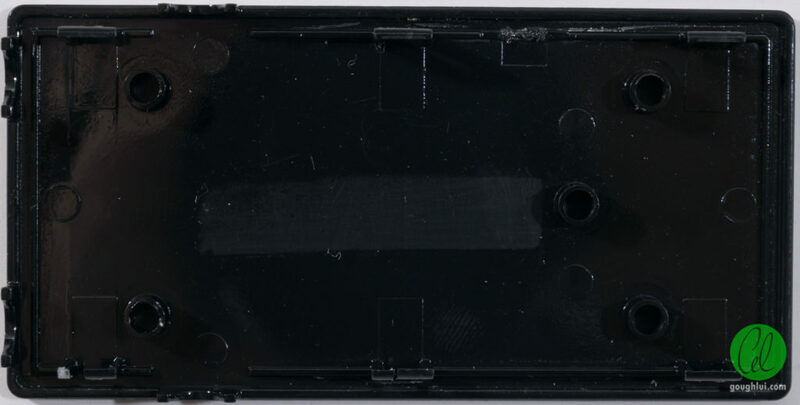 The plastic case is held together with clips internally that are difficult to separate without breaking. As a result, I don’t recommend taking apart the adapter as the casing will likely be partially damaged. The board inside doesn’t occupy the whole case, instead having some clearance from the sides. The rear has some power conversion (switching) circuitry, a reference oscillator and some passive SMD components. The opposite side features the RTL8814AU chipset, with a Skyworks SKYT85703-11 front-end module per port. 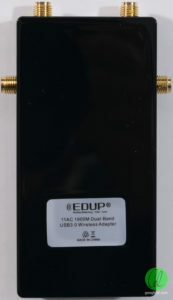 The module is specified for up to 16dBm @ 1.8% EVM at HT80, MCS9. The PCB seems to have provision for a hardware WPS button that was not fitted. The USB 3.0 filtering seems to be strangely located too – one set near the chipset, the other near the connector. Much of the PCB (marked UMB814A03-3V3, dated Week 40 of 2017) isn’t strictly necessary, it seems, so the adapter could have been much more compact. It seems that the top indicator would have functioned as a WPS button as well, but it is secured into place just as an indicator. 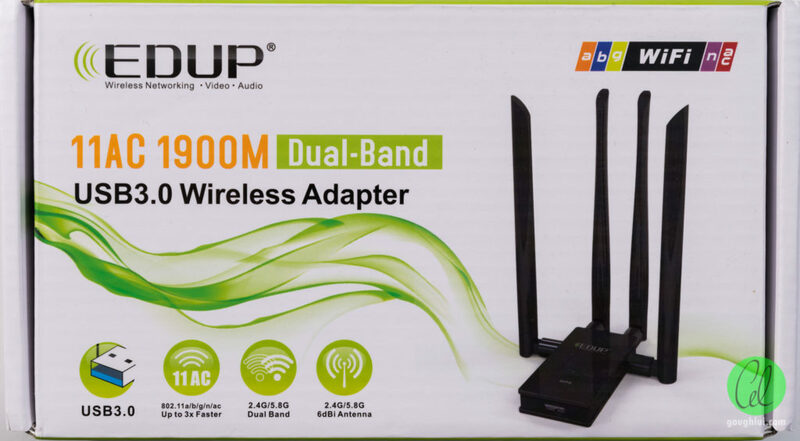 While it’s possible to buy a triple-stream 802.11ac adapter for less than the local shops might have you pay, it seems that the combination of equipment you use (e.g. laptop, adapter, access point, etc) can result in rather unusual results. In my case, through multiple tests, it seemed that the triple-stream adapter didn’t offer a big advantage over the dual-stream adapter in terms of maximum throughput where the signal was strong. Its main advantage was in weaker signal areas where it could maintain a higher throughput, suggesting there was some limitation with the AP (potentially), testing scenario or compatibility issue. 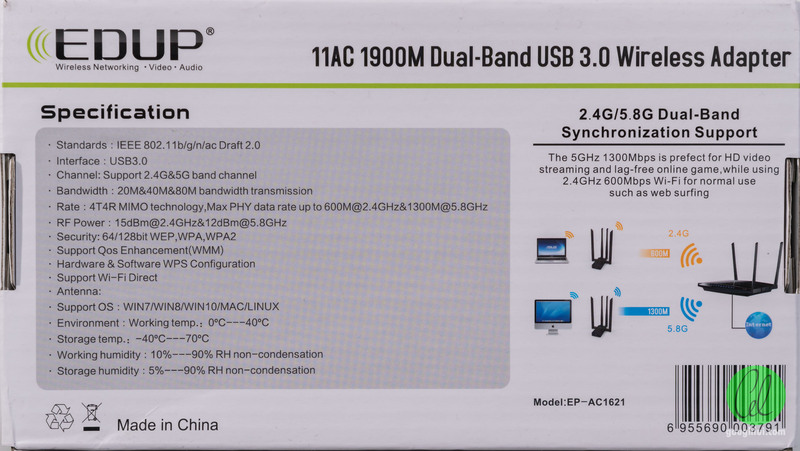 Despite this, the triple-stream adapter did connect with higher PHY rates, which should reduce air-time usage, allowing for an improvement in overall wireless system throughput. It also does have better Linux support than the ones I tested before, although it isn’t quite as stable as adapters from the 802.11n generation nor is it as convenient as it hasn’t been mainlined. The unit uses the same Realtek RTL8114AU chipset as in much more expensive units (e.g. Asus USB-AC68 ($99), D-Link DWA-192 ($89), Netgear A7000 ($99), TP-Link Archer T9UH ($79)), so it’s likely that I could have paid almost twice as much to end up with the same results. However, as there wasn’t any gain in maximum throughput, it seems that the two-stream AC1200 solution was probably the far better value for money option depending on your needs. After all, most smartphones only ship with single-stream (or at most, dual-stream) solutions and most laptops are restricted to two streams. Triple and quad stream solutions still remain a niche category – along with commanding a higher price tag. This entry was posted in Computing, Telecommunications and tagged cheap, computer hardware, ebay, made-in-china, networking, radio, review, rf, teardown, tested, wifi. Bookmark the permalink. 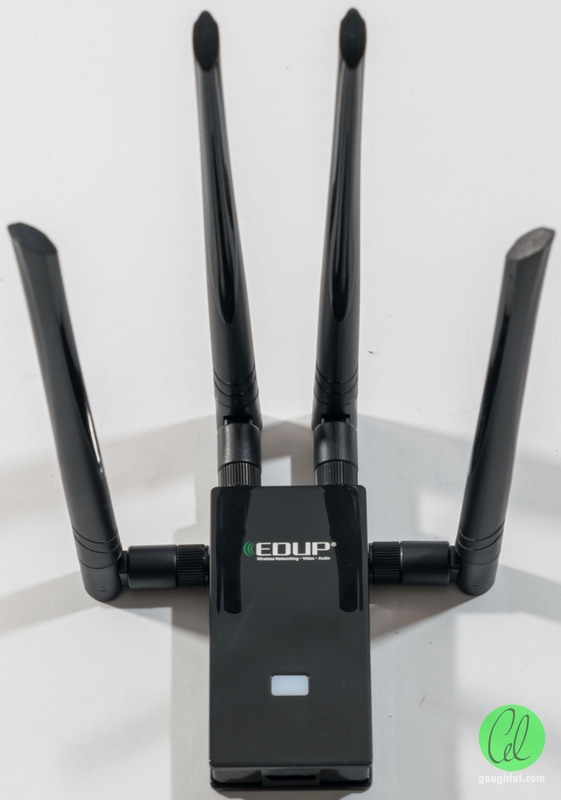 I bought the 1300ac version of this wlan device and it was working quite well. I wondered if perhaps latency is an issue that was causing the unexpected results. In my experience CPU load on a device doesn’t have to get that high to significantly increase the latency a device introduces to a data stream, as it can significantly lengthen wait times in a queue for a packet. This is of course dependent on the specifications of the device. I was suspecting USB latency was a key limiting factor, along with some possibly sub-optimal drivers or USB chipset to device specific compatibility/timing issue. However, knowing that even non-UASP USB bulk-only-transport mass storage devices can manage about 120MiB/s over the same ports, it seems the ~33MiB/s of throughput suggests there is some headroom still. Not having any warnings about plugging things into faster ports leads me to believe that the devices were connected via USB 3.0 but they just weren’t providing the performance that I expected. Using dd with a block size of 16MiB was easily capable of reading out the network share from cache at several GiB/s and over GbE (directly connected to the laptop port) at pretty much wire-line rates, so it’s probably not software side limited. As TCP is a windowed protocol, it shouldn’t be that badly affected by latency, however, it probably is sensitive to latency variation (which might lead the protocol to believe there is congestion and to back-off the sending rate). That being said, I did try with iperf3 and received slightly lower results, so it could just be the combination of equipment and my “lack” of multipath orthogonality – there were other oddities I had discovered which included (at times) being closer to the AP reducing the net effective data rate. That being said, an optimal pairing is likely to be in the 400-700Mbit/s ballpark for throughput … just a shame that my set-up isn’t quite there, but it’s still a decent step up from what you get from 802.11n.